The goal is to move surface fertile soil layer along with the minerals and organic – melioration fertilizers deeper inside of soil, where the largest mass of future roots will be created. 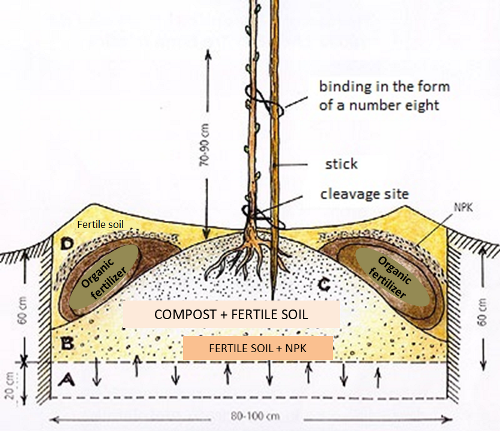 At the same time, the deeper and less fertile soil layer moves to the surface. The purpose of rigging is to spread the hard parts of soil. With that soil spread there is better chances for growth and branching of young roots. Rigging has to be done at least three months before planting. That will give enough time for soil subsidence. Beside, soil is grinded due to cold weather in order to collect the most from winter precipitations. It is necessary to follow basic rule that the seedling should be planted on same depth in which was at primary growing place. 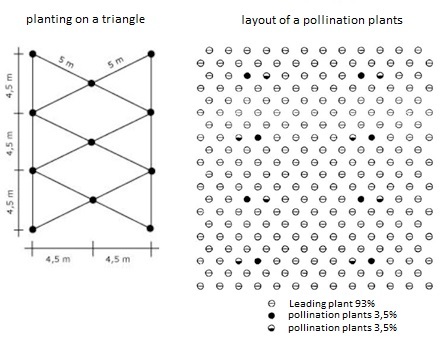 Otherwise, too much depth of planted seedlings causes stagnation for years before entering normal growth. Also, never place any kind of fertilizer around the roots, but the crushed soil from the excavated hole. In general, the grafted hazel needs a distance of 4 meters between the trees and 4.5 to 5 meters between rows, due to the subsequent passing of mechanization. The planting density of grafted hazel trees is slightly higher than the planting density of the bushes form and is about 500 to 550 trees per hectare. The lot on which the grafted hazel is planned to be planted, have to be capable of installing a drip irrigation system, not only for the necessary watering, but also because of the use of water-soluble fertilizers and other substances. It is necessary to follow the instruction for the annual treatment on the advice of experts on nutrition and plant protection. With proper care and nutrition, it is realistic to achieve the expected amount of hazelnuts.